Having always wanted to travel to Asia, Surya Tubach (18) decided to spend her gap semester volunteering with Projects Abroad in Thailand doing their Teaching Project. “I wanted to do something more meaningful than just backpacking around; I thought Projects Abroad provided the best opportunity and the best support for what I was looking for.” Surya was also very excited to learn about another culture while volunteering. During the six weeks that Surya spent in Thailand, she had the opportunity to be involved in a number of activities. 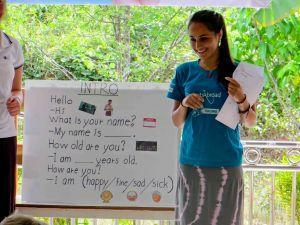 Not only was she teaching at her placement at a school in Koh Yao Noi, she also got to participate in a Road Show. This is a special activity where the volunteers teach the children of the community English through fun games and activities. 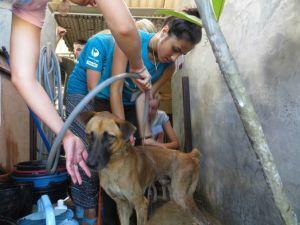 She also joined Projects Abroad in the October Outreach at Lanta Animal Welfare to take care of abandoned cats and dogs. Lanta Animal Welfare is an organization that hosts all stray and abused cats and dogs; it is also a clinic giving treatment and sterilization to the animals. All volunteers that went there were divided into groups to do different things. Surya joined the Care Group where she gave the dogs baths and took them out to walk on the beach. We hope that great stories like these inspire others to help Projects Abroad to continue to make a difference and, in doing so, learn something themselves along the way.